Tips on weaner management - especially of the smaller and poor quality pigs - from Michigan State University Extension Educators, Beth Ferry and Thomas Guthrie in 'MSU Pork Quarterly'. When transitioning quality pigs from the sow at weaning to the nursery phase, a goal for pork producers is to maximise performance while minimising loss, thus creating the opportunity to optimize pig lifetime performance. However, this transition period can be challenging for pigs and producers due to added stressors such as change in diet from liquid to solid; susceptibility to changes in environment in regard to temperature and possible air drafts; and lack of immunity against disease. Therefore, it is imperative that pork producers have a consistent way of identifying quality pigs and an established plan to manage pigs that are considered to be sub-standard. Often times, the question is posed, what is considered to be a quality pig? This may seem like a relatively simple question to answer but in many cases, it is really dependent on the respective operation and the parameters set forth to distinguish a quality pig from a sub-standard one. Maybe the better question or consideration in this case would be; does your respective operation/farm system have a standard operating procedure to differentiate between a quality pig and a sub-standard pig? Along with this, does your operation have a plan for managing those identified sub-standard pigs? When considering sub-standard pigs, there are many common terms that may define a “sub-standard” pig including: “off pig”, “fall back”, “subject”, “rescued”, “disadvantaged”, etc. There are several indicators that can be used to differentiate between quality and sub-standard pigs. These indicators typically encompass pig evaluation parameters that are usually known such as weight, age, appearance and health status. However, these are not necessarily all-inclusive. A standard operating procedure can range from simple to very detailed but in any case, it is a written plan that provides guidance in the decision making process and provides a training tool for incoming employees. SOPs can vary greatly amongst farms in regard to transitioning pigs from the sow to the nursery. For example, goals for the transition period may range from weaning pigs as old as possible, a pig requiring alternative management such as utilisation of a hot nursery if it is a pig they would not purchase, to the goal of every pig being a USDA #1 pig. Parameters used to differentiate between quality and sub-standard pigs can range from the pig weighing at least seven pounds, with sound legs and good health status to pigs that are at least 19 days old, weigh at least 11lb and have no defect of any kind, e.g. rupture, soundness, crinkle ear, etc.). In addition, identified individuals such as site managers and/or trained employees are typically in charge of quality pig selection and responsible for determining alternative management for identified sub-standard pigs. Straw and May (2008) conducted an experiment to investigate how well rescued, fall-back pigs perform in the nursery and finishing phases. Pigs in this experiment were assigned a category within first few days: 1) Fall backs: pigs were raised on nurse sows 2) Milk-fed: high performing pigs were raised on nursery decks and 3) Controls: pigs that did not receive alternative management and left on the sow. Results of this study indicated that identified fall back pigs performed equal to the control pigs during the nursery and grow/finish phases and nursery exit weights for all identified fall back pigs and controls were equal. This study concluded that pigs that fail to thrive in the first few days of life are capable of performing adequately if a management plan is in place to provide supplemental care and sub-standard pigs can achieve weights at the end of the nursery phase comparable to “quality” pigs if bodyweight is comparable to their cohorts when entering the nursery. Having a management plan for sub-standard pigs is important. Setting the stage by providing the proper environment (clean, warm, draught-free), as well as identified areas for sub-standard pigs can reduce negative impacts on future performance such as flow, marketing and overall production. Optimising sub-standard pig management will aid in maximising performance and growth of sub-standard pigs. Various different production practices can be used to help increase productivity of identified pigs, some of which are summarised below. One way to optimise sub-standard pig management is to feed a specified diet formulation, comparable to the growth and development of a weanling pig. It has been found that at weaning, lighter pigs have less developed gastrointestinal tracts verses piglets with a higher weaning weight (Pluske 2013). Therefore a pelleted diet, formulated so that it is easily digestible for the weanling pig is preferred. When using a pelleted feed, not all products are as digestible and specifically you are looking for a product that has a small percentage of pellet fines associated with it. It has been recommended that you use a feed with 20 per cent or less of pelleted fines. Studies have also shown that when formulating diets for sub-standard pigs, it can be advantageous to use a feed that included antibiotics. Animals fed such diets have been found to have a greater average daily gain, average daily feed intake and final pig weight (Sotak, et al, 2010). However, it is noted that along with this practice comes an increase in feed costs, which impacts overall profitability. Various studies have shown that incorporating production practices that require you to split-wean the litters can also increase weaning weights, which will help ease the nursery phase transition period. Research completed by Lawlor and co-workers (2002) found that by early weaning a portion of the litter from the sow, the piglets remaining in the litter weighed 0.5 pounds more at weaning than weaning full litters of pigs. This is done by reducing the litter size on the sow so that you increase the availability of the sow’s milk for the remaining piglets. It is suggested that, when you are split weaning, the litter is taken down to seven or eight pigs in order to increase weaning weights of remaining piglets. Piglets that remain in reduced sized litters have a higher frequency of teat swapping and longer length of suckle time, resulting in increased consumption and weight gain. This increase in weight gain however is not sustained throughout the growth period. Documented studies show that if creep feed intake is high, a slight increase in weaning weights can occur. Every 2.2 pounds of consumed creep feed equals 2.5 pounds of gain for the litter. Increased intakes of creep feed have also shown increases in growth rate during the post weaning period. (Lawlor, et al, 2002). It has been found that creep feeding piglets prior to weaning is more effective when pigs are weaned later than 21 days of age. This can be associated with the gut development and maturity at that stage. When adding creep feed to the diets of your pre-wean piglets, your goal should not be to improve weaning weights for the litters but to expose young pigs to a solid diet. This helps the piglet transition to a nursery/solid food diet and decrease the post-weaning lag that sometimes occurs at this time. Studies done at Kansas State University explain that the length of time pigs have access to creep feed will not increase the weaning weight of the piglets, however with extended exposure to creep feed more piglets will eat creep feed and have an easier adjustment to solid feed in the nursery phase. Both practices - split-weaning and creep feeding - show minimal lifetime improvement but may be used as a management strategy for small or lighter suckling pigs. A typical measurement of a quality pig for most operations is the weaning weight of the piglet. A higher weaning weight is desired by farms because one characteristic of sub-standard pigs is a lighter bodyweight at weaning, which is associated with slower lifetime average daily gain. This allows for increase competition from larger/average size counterparts in group nursery settings and creates an undesired environment for pigs that may already be challenged. Studies completed by Iowa State University in 2012 compared 120 piglets, representing 10 per cent of each of the light, medium and heavy weight pigs from a 960-head nursery and observed over 27 days. Piglets were split into three treatment groups, representing their weight category and were fed ad libitum quantities of a typical nursery diet. Following the 27-day nursery period, it was found that the heaviest pigs at weaning had the greatest average daily gain and the lightest pigs at weaning had the lowest average daily gain. Feed efficiency and carcass composition was not affected by the weaning weight of the piglets (Jones, et al, 2012). We can then conclude from this information that to maximise growth, bodyweight, ease of transition and productivity, a heavy weaning weight is desired. In the end, attention to detail will be advantageous for all involved, ranging from the pig to the producer. Implementing a consistent way of identifying pigs will aid in determining how respective pigs (quality vs. sub-standard) may need to be managed. Furthermore, increasing communication to create a better understanding of how pigs are classified will potentially lead to improved pig management efficiencies. It is important to recognise that the development of a standard operating procedure is not a 'one size fits all' approach, and the practices that you employ on your farm should fit your operation. Procedures will be dependent upon respective operation/farm system limitations that may include facilities, resources, pig flow, etc. Moreover, it may be important to reflect on the goal of consideration that was previously mentioned at the start of this article, to maximise performance while minimising loss that creates the opportunity to optimise pig lifetime performance, making it a win-win for everyone. Jones, C.K., N.K. Gabler, R.G. Main and J.F. Patience 2012. Characterizing growth and carcass composition differences in pigs with varying weaning weights and post-weaning performance. J Anim. Sci. 90 no. 11: 4072-4080. Lawlor, P.G., P.B. Lynch, G.E. Gardiner, P.J. Caffrey and J.V. O’Doherty. 2002. 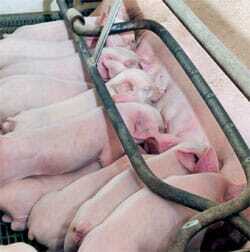 Effect of liquid feeding weaned pigs on growth performance to harvest. J. Anim. Sci. 80:1725-1735. Sulabo, R.C., Tokach, M.D., Wiedemann, E.J., Jacela, J.Y., Nelssen, J.L., Dritz, S.S., DeRouchey, J.M. and Goodband, R.D. 2007. Effects of varying creep feeding duration on proportion of pigs consuming creep feed and pre-weaning performance. Kansas State University. Agricultural Experiment Station and Cooperative Extension Service. Sotak, K.M., Tokach, M.D., Hammer, M., Jacela, J.Y,; Dritz, S.S., Goodband, R.D., DeRouchey, J.M. and Nelssen, J.L. 2010. A comparison of Denagard, Denagard/CTC and Pulmotil on nursery pig growth performance and economic return. Kansas State University. Agricultural Experiment Station and Cooperative Extension Service. Straw, B. and G May. 2008. Supplementing Fall Back Pig Pays in the Nursery. National Hog Farmer. December 2008.